While it may first appear complex, the Multi-Channel music sequencer made famous by User FVDisco is rather simple in principle. It relies on proper combination of timing and tone to create music. Each music channel produces the sound of an instrument using music blocks programmed to a specific tone and timing, just like individual instruments in an orchestra might make up a single piece of music. The complexity of the music played is up to you, as long as you remember to utilize the simple steps provided in the guide below. The basic component of the multi-channel music sequencer is the redstone timer. 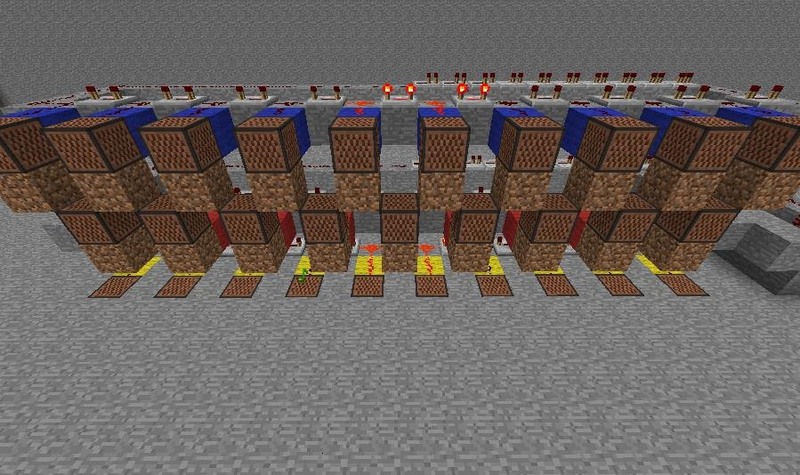 The redstone timer determines the timing that each individual music channel will produce. The rhythm that each channel produces directly determines the final outcome of the music you wish to make. 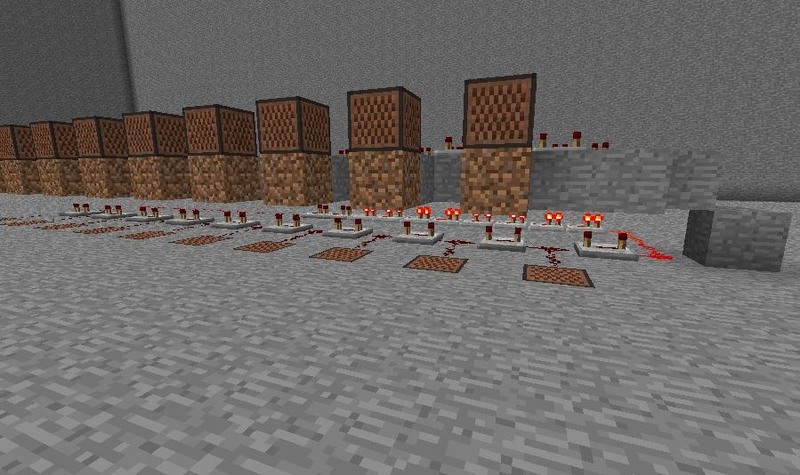 Each redstone circuit is connected to music boxes that will play notes based on the timing set or "programmed". 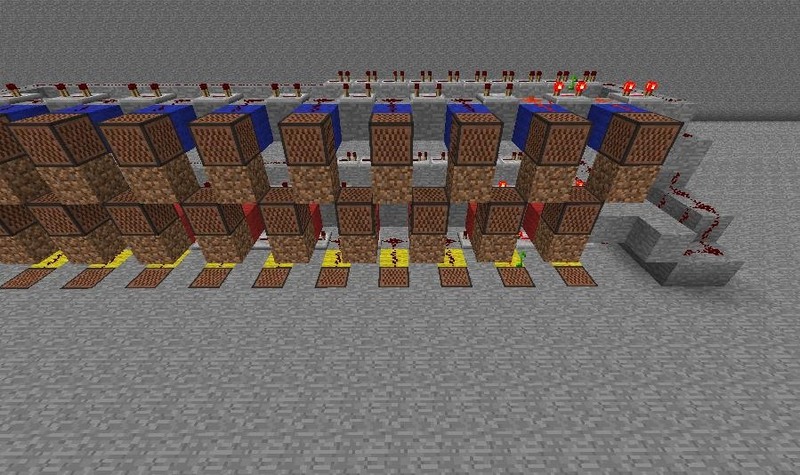 (1) The redstone timer I created is made from ten redstone repeaters with a space in between, each connected by redstone wire. These repeaters are set to their longest setting. 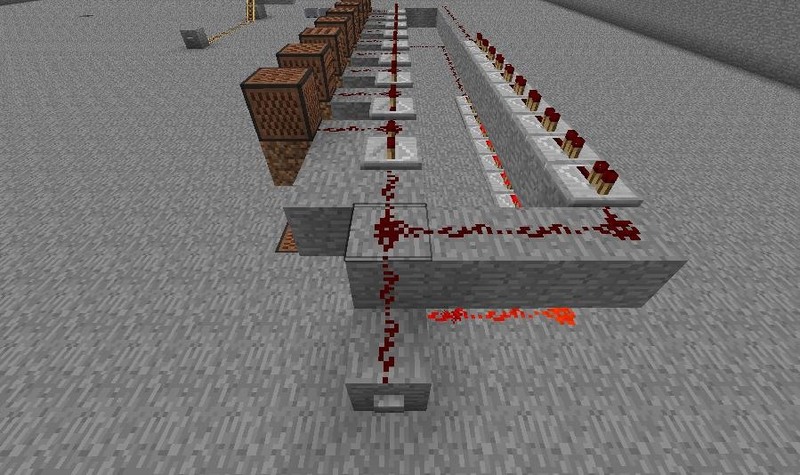 As a redstone current runs through the timers they produce a five second loop. I connected this circuit with a second timer of set of repeaters set to their shortest setting. 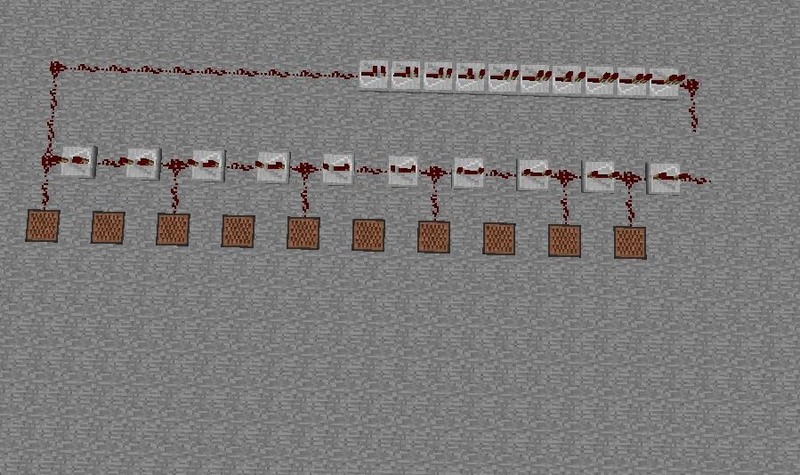 (2) Each of the redstone repeaters corresponds to a music box. As the circuit runs each music box will play according to the timing set. Here I have connected every space in between each repeater connecting to a music box. These music boxes are set on top of stone blocks, so that they produce the drum channel of my music sequencer. , (3) To send the initial pulse through your music channel or channels I suggest using a stone button as it will only send one pulse at a time. (1) Here I have added a second music channel directly above my first one. This time I placed the music boxes on top of dirt blocks so that they play the piano sound. You may place them on any block you choose. The real trick lies in programming the boxes by left clicking them for the scale you wish to create. 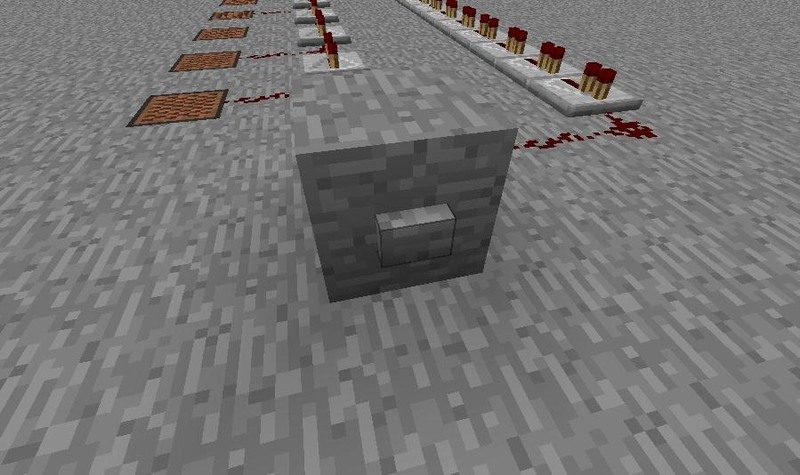 (2) Remember, if you wish to change the timing of a particular channel you may do so by removing the redstone connections between the music boxes in their corresponding spaces. 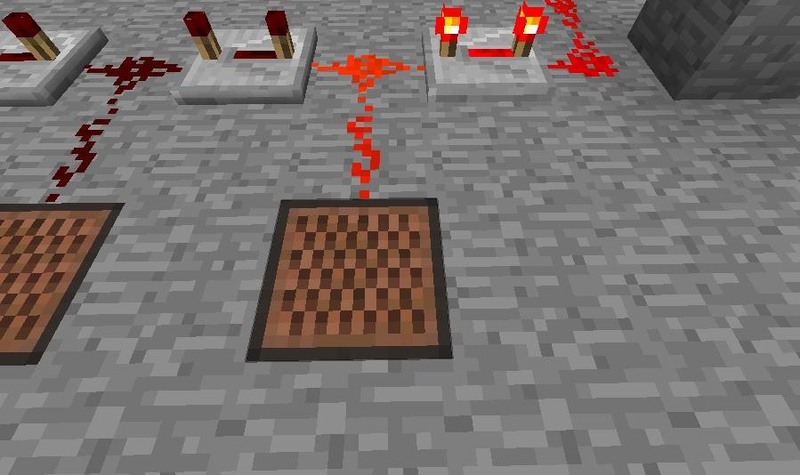 Removing every other connection will result in a beat twice as slow as the beats in a channel with full redstone connections. , (3) Be sure that as you go along you connect the stone button you have set up to send the initial pulse to each connected channel. The pulse should set to the same timing on each channel. (1) Here I have a third and final music channel set up. My third channel is a channel of piano music blocks tuned to a higher tone than the previous one. 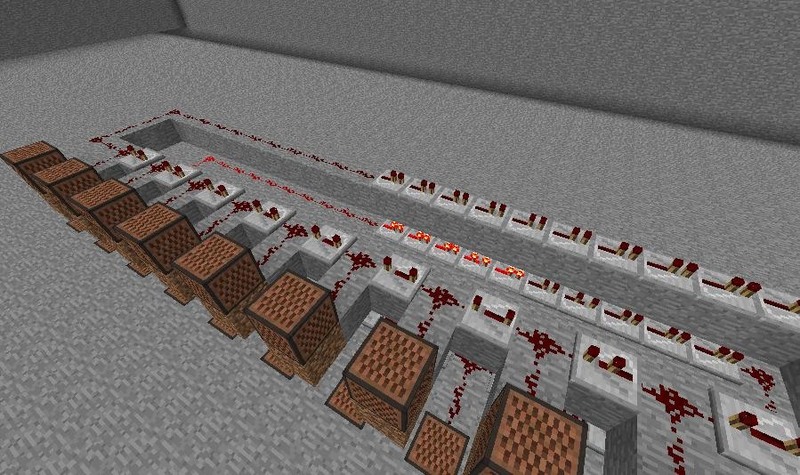 In this simply ten pulse music machine I have adjusted the timing and tuning of each channel to produce a beautiful Minecraft rendition of "Hot Cross Buns". The perfection of your particular musical creation will rely on the programming of each channel to a particular timing and tune, which will take some practice as you go along. , (2) The complexity of the musical piece you choose to create will be determined by the timing of each channel and the number of channels made. The larger the channel, the more beat you will be able to produce per loop and the more channels the more tones you can produce per song. Remember to keep your channels consistant in musical range and timing, always having the finished product in mind. Be sure to experiment with various combinations of timing, tune, and sequence to arrive at the musical arrangement you desire. With a little planning, you can begin to produce musical compositions as complex as you can imagine! Thank you to all who contributed to making last Saturday's workshop fun and engaging!